Tonight’s game against the Los Angeles Kings could mean more for the Vancouver Canucks than avenging their disappointing loss in their last meeting on November 25th. 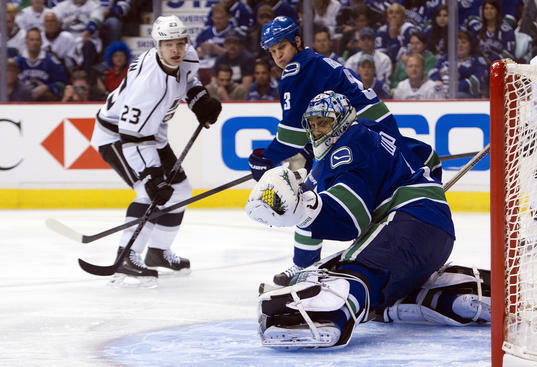 In that game, the Canucks took a 2-1 lead early in the third period, only to see the Kings tie it up with less than 3 minutes left, and then eventually win it 48 seconds into the overtime period. That game was the last game of the Canucks’ 6-game homestand, one in which they won just once (1-2-3). By the end of that game, the Canucks were in 5th place in the strong Pacific Division, 6 points back of the Kings, and having played 1 more game than them. Tonight, in the third of five meetings between the two teams this season, the Canucks sit just 1 point back of the Kings and having played the same number of games. They haven’t beaten the Kings this season, but a win tonight in regulation would move them into 3rd place, past Los Angeles, in the division. Canucks goaltender Roberto Luongo is back tonight, having recovered from his lower body injury. Tom Sestito. Yes, you read that right, Tom Sestito. Sestito is on a two-game point streak (1 goal, 1 assist), his first multi-game point streak since 2010 when he was still a member of the Columbus Blue Jackets. Defenseman Dan Hamhuis has been doing well on the scoresheet. He played almost 30 minutes against the Tampa Bay Lightning and was on the ice for all 6 goals scored by both teams. He has 4 points – all assists – in his last 5 games. For the Kings, forward Anze Kopitar has 5 points (2 goals, 3 assists) in his last 6 games. After winning his first 8 games, Kings rookie goaltender, Martin Jones, has now lost his last 3 games. The Canucks are still without forwards Alexandre Burrows, Jordan Schroeder, and defensemen Alexander Edler, Andrew Alberts and Ryan Stanton. However, Burrows, Schroeder and Edler all skated this week.